Art Displays will begin on Monday, August 26, 2013. The focus of my current body of work is the beauty of the individual and it is inspired by Mexican narrative ballads called corridos. In keeping with my love of portraiture, during my international studies in Mexico I chose to draw vendedores ambulantes or street vendors. Although many corridos immortalize heroes, many highlight the plight of the common man and especially the Worker. I kept this in mind when I studied abroad and produced a series of drawings which includes this piece, Pulseras. While studying abroad last year, I spent time in the cities of Toluca, Merida, Campeche and Mexico City. The streets teemed with life, sounds, smells and colors, but I kept being drawn to the street vendors; they are on every corner selling mini-hammers, candy and cigarettes, pirated music, book lights, and a plethora of other goods. In this series, I drew individuals I encountered. 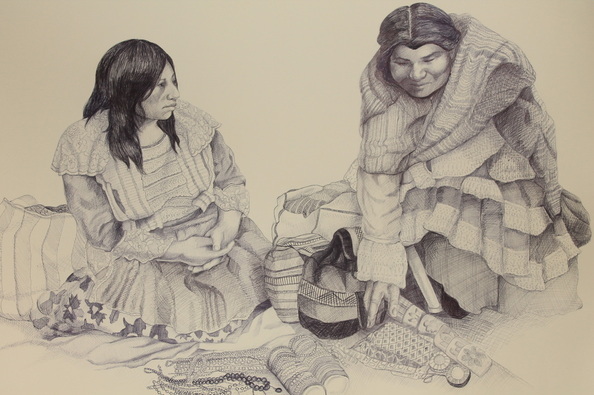 The two indigenous women depicted in this piece were in Toluca, selling their wares on the backside of Los Portales during Dia de los Muertos. Born in California's Central Valley, Linda Lucía Santana earned her Bachelor’s degree in printmaking and minor in anthropology at the University of California, Santa Cruz. During her time in Santa Cruz, she was on the Dean’s List, and was the recipient of the Florence French Scholarship, and the Eduardo Carrillo Scholarship. She was also the historian and teaching assistant for the Mexican folkloric dance group, Grupo Folklorico Los Mejicas. Her parents, uncle, and brother, UCSC alumni, also were members of the group. After graduating from UCSC, she worked as a portrait photographer and taught art and dance classes at an elementary school and art at a private gallery. She then moved to Kansas City, Missouri where she worked at a non-profit organization and assisted at a community printshop. Linda completed her terminal degree, a Master’s in Fine Art in printmaking, at the University of North Texas in Denton, Texas this May. While studying at UNT, she taught undergraduate courses as a teaching assistant, instructor of record, and adjunct instructor in Drawing I and Relief Printmaking. 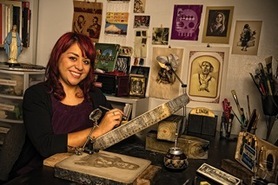 Linda is one of the founders of the Bump It Mafia female printmaking network and is active in conferences and workshops across the country. She has been exhibited both nationally and internationally. Most recently she has exhibited at the Bradley Biennial, The Rising Eyes of Texas showcase, and at venues in the DFW metroplex such as the WoCA Gallery, Gallery 414, the Latino Cultural Center and Artes de la Rosa at the Rose Marine Theater.